Provides dedicated place for one-handed access to tissue, easy to fill and clean, 3 divided compartments makes desk neater and tidy. External surface is made of high quality PU leather, which is attractive sturdy and durable, lining interior is made of selected non-woven, which is waterproof and anti-moisture. 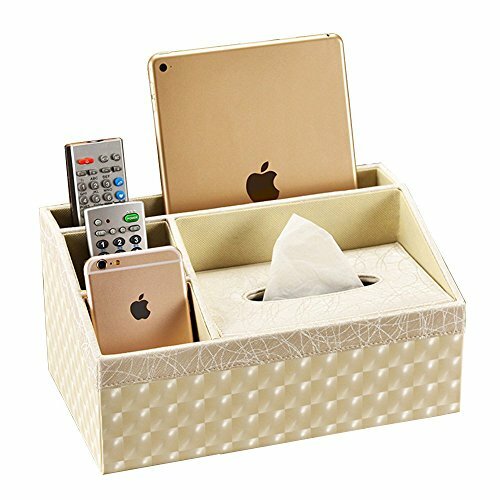 Restaurant, office, household, hotel rooms tissue storage consolidation, make your space more tidy, and make your desk organized. Say goodbye to your mess desk, you will have everything in order, then you can focus your mind on your study. Your phone, remote control or something else will not fall down or broke with this protective organizer. We offer a 30 day Money Back Guarantee if you are not satisfied with our product. 1. The color of the actual items may slightly vary from the above images due to different computer setting, thanks for your understanding. 2. The size is measured by hands, so it may be a bit tolerance(About 1 CM).